After an extremely successful haul of gullies and ice last year, Pete, Cameron, Niall and I hoped to build on our success. In the days before the Scotland trip this year however, it became apparent that all of or our new ice gear would be of little use. Instead we reached for our trad racks and stickies. Upon arrival in Scotland, it was impossible to believe this was the same week as the 2018 trip. With sun and blue skies, this was a summer trip in all but one way, no midges. 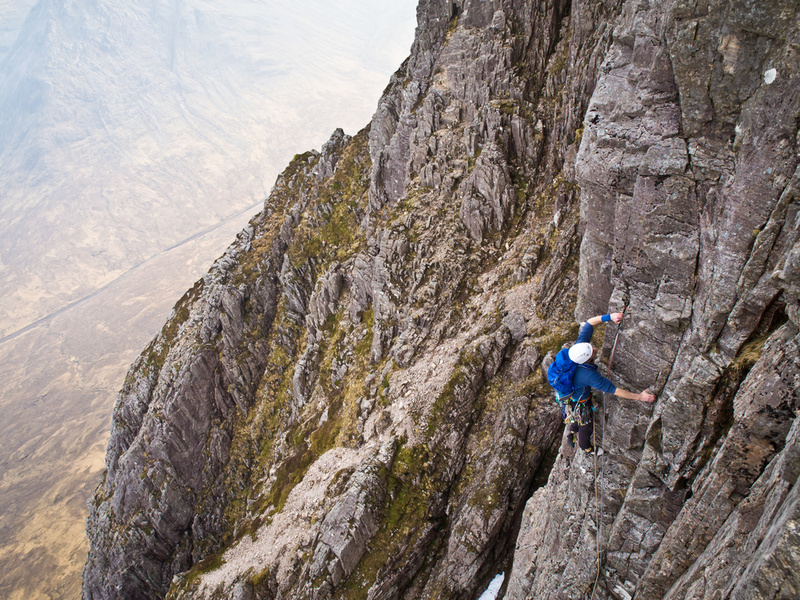 Day one saw an ascent of the classic five pitch HS, Ardverikie Wall followed by a quick jaunt up Kubla Khan, both a short drive from the accommodation and as dry as you could ever hope for. With confidence high, the following day we headed for the Cairgorms to attempt something larger; however many of the higher routes remained wet due to melt from the little snow that remained. 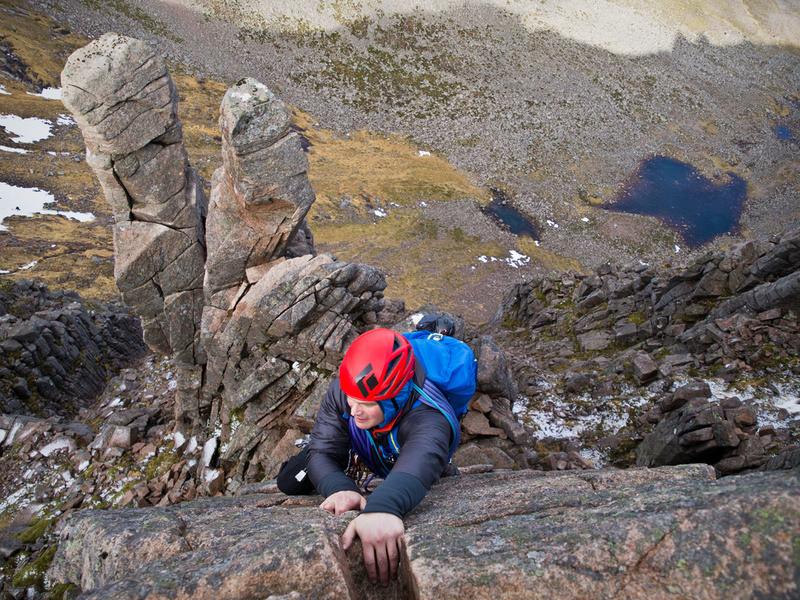 After a bit of hunting we found the three pitch VS, Whispers to be completely dry, before finishing the day with a solo up the Mod, Serrated Ridge on Stag Rocks. 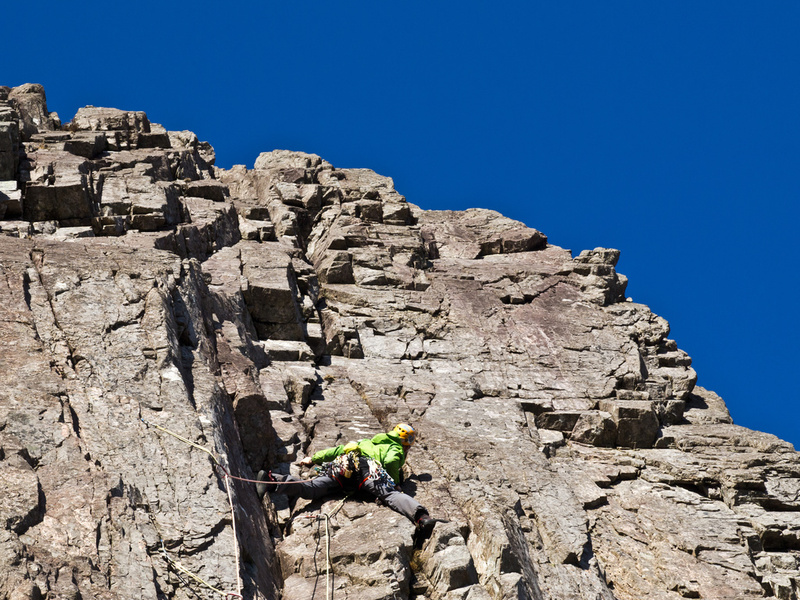 By mid-week the temperatures were in the mid-teens out of the wind and we found ourselves climbing on Bauchaille Etive-Mor in t-shirts, racking up 9 stars in an epic day. Only on day four did we encounter any wet rock on the Etive Slabs. 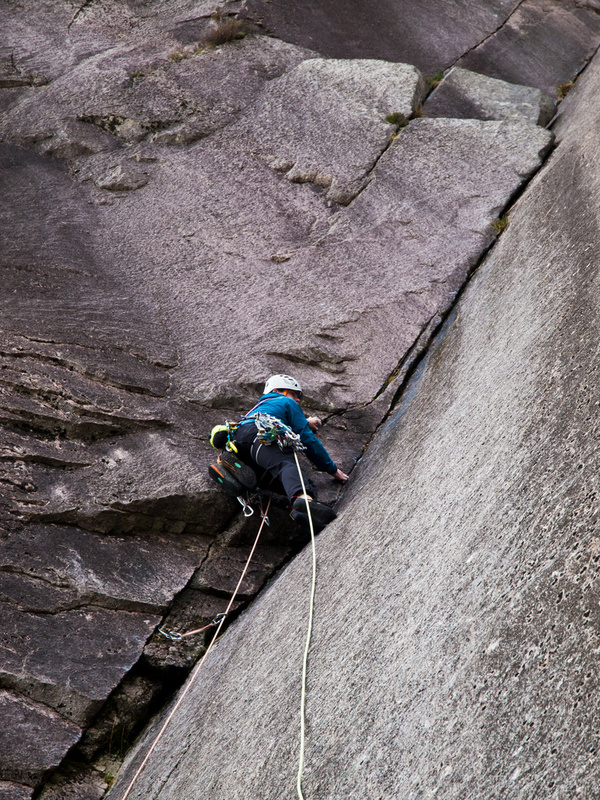 Despite a soggy first pitch and less than ideal friction slab traverse, we completed the three-star HVS, Hammer. 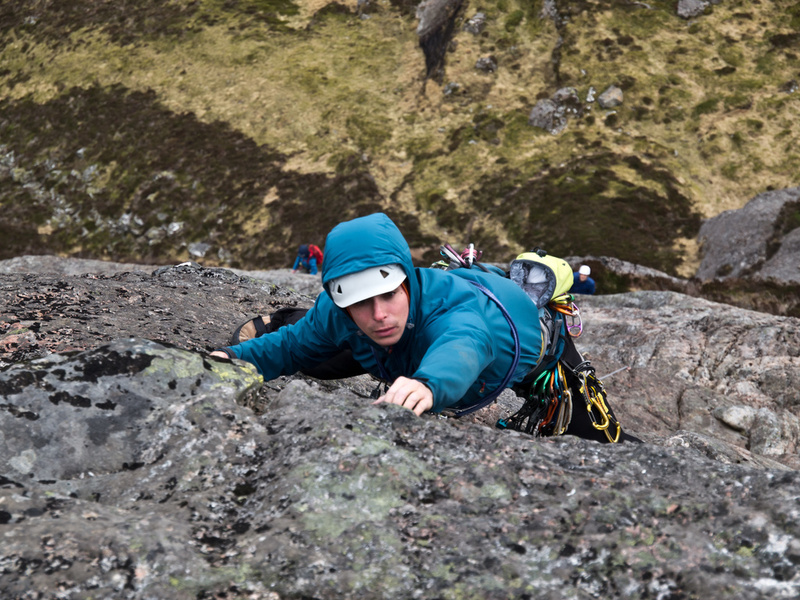 By day five, the weather was looking like it could finally break, so we opted for some roadside multipitch at Creag Dhubh, bagging a coupled of HVSs including the incredible, imposing and pumpy Inbred. Thankfully the weather gods stayed kind. 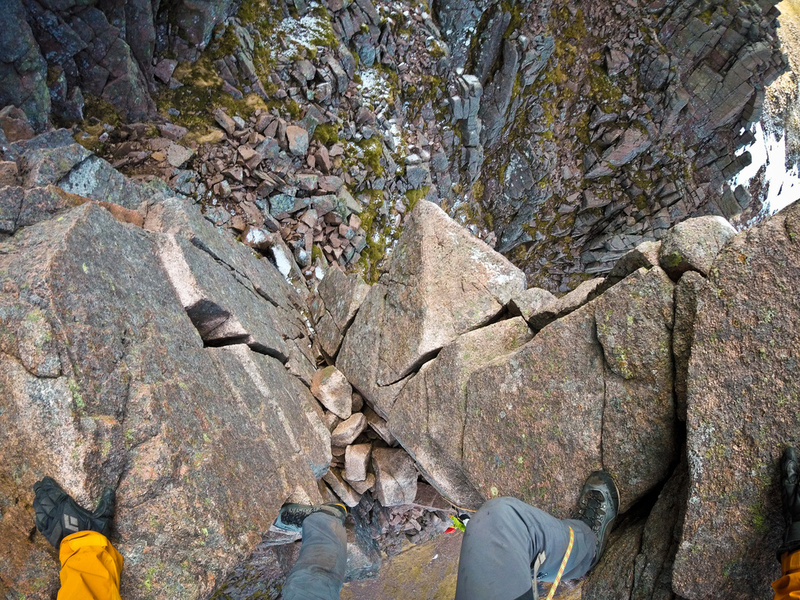 With an early start, day six saw a simul-climb ascent of the classic Diff, Fingers Ridge followed by a solo of the Mod, Afterthought Arête, for the home run of six of six days epic trad. Straddling the fingers of Fingers Ridge. This entry was posted in Articles, Trips. Bookmark the permalink.